Hank Roberts' Green probably has nothing to do with going "green" (the trendy cultural buzzword for being ecologically aware). But it does offer music that has the environmental aura of expansive open plains, ruralesque backdrops, and majestic mountainscapes within a distinct, rustic and avant-garde music setting. A world class cellist who could easily excel in any music genre, Roberts may be more recognizable in improvised music settings, and past performances with seminal artistsdrummer Joey Baron, saxophonist Tim Berne and guitarist Bill Frisell, as well as his own releases Black Pastels (1987) and Birds of Prey (1990), both on JMT recordings (now Winter and Winter). 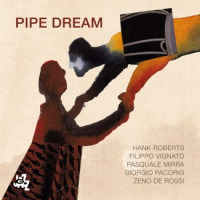 Though some things have changed since his last recording, Roberts' progressive leaning bend toward the outside hasn't been altered as witnessed on this outstanding release. From pastoral and somber moods to a 1960s LSD-laced trip on one track, the recording's a blend of both the familiar and strange. The bucolic and serene beginning of "Azul" gives way to growing tension then returning calm like witnessing the coming and passing of a storm. A fervent voice in "Prayer," the down-n-dirty funk of "In the 60's," and the eccentric "Cola People," are all pleasantly unpredictable, creating a listening environment that's memorable and mysterious. Roberts is in total command of his cello, able to produce multiple voicings plucking, strumming, tapping and beautiful bowing. He also provides earthy vocal on a couple of tunes; such as "Trees," a hard rocking piece, with some nasty guitar work by Ducret, where the stirring lyrics are suggestive of Native American Indian folklore, or a narrative on present day forestry issues. Creativity is at the recording's center and reaches its apex on "Lenape Suite, The Departing Hunter's Song/War Dance Song/ Jersey Devil," a sonic voyage that includes an aboriginal-like motif and lyrics, electronics colorization and a frenzied (yet awe inspiring) trio performance that's unsettling yet hypnotic. In contrast, this is followed by "Long Walk," the recording's most picturesque track. Green is uniquely captivating, haunting yet warmly assuasive and, true to Roberts' form, not easily categorized. A wondrous journey for those who appreciate music of, literally, a different shade of green. Track Listing: Azul; Bernie Suite, Bernie Alap; Bernie Suite, Prayer; Bernie Suite, Bernie; In the 60's; Cola People; Trees; First; Lenape Suite, Lenape Alap; Lenape Suite, Nasfet; Lenape Suite, The Departing Hunter's Song/ War Dance Song /Jersey Devil; Long Walk; Gentle; Pictures. Personnel: Hank Roberts: cello, vocals, guitar; Marc Ducret: electric and acoustic guitars; Jim Black: drums, electronics.